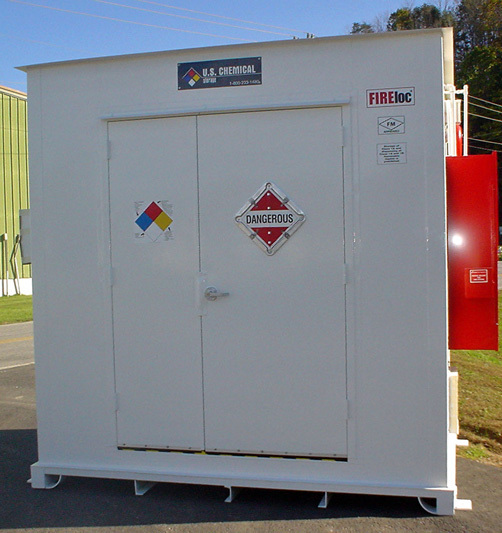 Combustible storage buildings should adhere to safety regulations for the protection of your personnel and inventory. Fire resistant construction and fire suppression systems can offer increased protection to your personnel, maintaining a safe environment within your facility. Fire rated storage buildings are designed to house combustible materials, with climate control and spill containment for additional security. When it comes to chemical storage, safe practice is not an option. Combustible materials should be handled with care. We offer fully compliant combustible storage buildings meeting all EPA, OSHA, NFPA regulations, UL Listed and Approved and Warnock Hersey Approved for maximum security and safety. Combustible liquids are defined as liquids having a flash point at or above 100 degrees Farenheit. Other combustible materials such as dusts and gases are capable of burning if exposed to temperatures at or above their flash point. Combustible dusts are fine particles, and an explosion hazard when suspended in air. Safe practices can mitigate the hazards associated with combustible storage. Your chemical storage building should be locked and labeled to restrict access and alert personnel to hazardous conditions, and the structure should be separated from all sources of ignition. Your combustible storage should also be segregated from other chemical storage, to minimize damages in the event of a fire. For your combustible storage, you require safe, compliant structures that are customized to fit your needs. U.S. Chemical Storage has buildings for combustible storage, fire rated for 2 hours or 4 hours. Featuring hand-welded, heavy-gauge steel – our combustible storage solutions exceed safety regulations to bring you revolutionary protection. Multiple layers of fire-resistant gypsum wallboard are located between the interior and exterior steel layers for enhanced safety. Containment sumps are designed to contain spills, preventing combustible materials from entering the environment and traveling to sources of ignition. An optional spill detection device can provide an audible or visual alarm in the event of a hazardous spill. We have a line of accessories to further customize your combustible storage building. Mechanical ventilation can prevent the buildup of combustible vapors or fumes. Our fire suppression systems are designed to control fires and alert personnel to potential hazards.